When you're designing the kitchen of your dreams, you probably envision a glorious gas range with six burners, a stainless steel French door fridge, a four-seater granite island, custom oak cabinetry. While all of these elements will create a gorgeous kitchen you won't ever want to leave, what really makes a kitchen unique and stunning? The kind of custom range hoods you won't find at most Kelowna appliances stores. In another article, we're going to put together a custom range hood buying guide to give you a sense of how the process works. For now, we want to give you some ideas about the looks you can achieve with a custom range hood not from your big box Kelowna appliance store, but through your high end, best-selection-in-the-Interior Vernon appliance store. Where stainless steel chimney-style range hoods are sometimes the focal point in an open concept kitchen, in others, range hoods go under cover. These custom hoods are referred to as hood inserts. 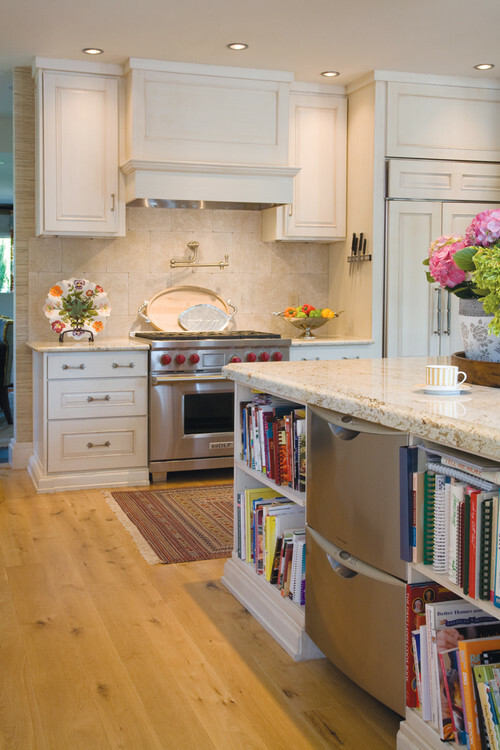 A hood fan simply slides into cabinetry made by your cabinet maker. From the outside, you don't even know there's a hood fan. Hidden hoods give your cabinetry a custom, seamless appearance, and they allow other elements or appliances—Italian tiles or an AGA cooker, for example, to shine in the spotlight. Copper range hoods are truly works of art. They add an eye-catching layer of texture, and somehow evoke that earthy feeling that we humans have been doing this—preparing our family's meals using the handcrafted natural materials—for centuries. 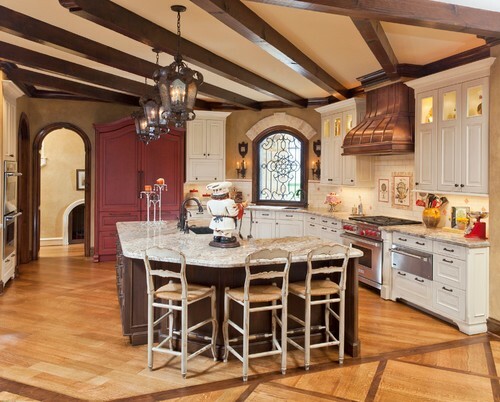 Many copper hoods offer handmade touches such as patinas and decorative metal accents. If your kitchen needs a focal point and you've got a bit more money to spend ($2,000 plus), look no further. You might think copper hoods wouldn't pair well with stainless steel appliances, but as you can see in this photo, the materials complement each other well, creating more of a fabric in your kitchen. Designing a custom hood that's wider than your range would have been unheard of even a few years ago. The way it had always been done was to create a hood that was the same size as the range—typically 30 inches. And then, in this era of blinged-out kitchens where homeowners want to showcase their home's personality in this most visited room, and where standard ranges are now more like 48 or even 60 inches, designers discovered that marrying a gorgeous custom hood just a few inches larger than the range gave a kitchen a stand-out piece of architecture. It's simply for aesthetics. What a statement. Do you have eyes for a custom hood but the budget for a standard hood? Find out which type is best for you and your kitchen in our post, A Range of Range Hoods: Choosing Kitchen Ventilation in Vernon and Kelowna. When you're looking for a custom range hood you can admire for decades, Genier's in Vernon carries the appliances Kelowna homeowners really want.